The Patriots stayed in mid-season form on Sunday, as Tom Brady tore up another defense, throwing for 423 yards as the Pats took down the San Diego Chargers 35-21 to move to 2-0. Brady completed at least one throw to seven different receivers, with Deion Branch amassing 129 yards on eight grabs. Rob Gronkowski caught four balls for 86 yards and a pair of touchdowns. Green-Ellis gained 70 yards on 17 carries for the Pats, who have yet to lose a home opener at Gillette Stadium. The facility opened prior to the 2002 season. The Chargers (1-1) kept it close for awhile, but turned the ball over inside the Patriots 35-yard line three times, leading to 17 points. San Diego was also stuffed on a fourth-and-goal at the 1, and the Patriots started a 99-yard drive that ended with one of Brady’s two scoring passes to TE Rob Gronkowski. Philip Rivers threw for 378 yards for the Chargers. They had four turnovers for the second straight year against New England after losing 23-20 in 2010 when the Patriots gained just 179 yards. Vincent Jackson had 172 yards and two touchdowns on 10 receptions for the Chargers. The turning point of the game took place late in the first half when Vince Wilfork, the Patriots’ 325-pound defensive tackle, got his first career interception to halt a promising Chargers drive, rumbling 28 yards on the return. The turnover set up a 47-yard field goal by Gostkowski on the last play of the first half, putting the Patriots on top 20-7, and they cruised from there. After neither team scored in the third, the Chargers made it 20-14 on a 3-yard scoring pass from Rivers to Jackson with 13:33 left. Then the Patriots made a curious—and potentially costly—decision on fourth-and-4 at the San Diego 49. Rather than have Zoltan Mesko, who hurt his knee on his previous punt, kick the ball, the Patriots went for a first down and failed on Brady’s incomplete pass to Deion Branch. But just three plays later, New England’s defense came through when Mayo forced a fumble and linebacker Rob Ninkovich recovered at the Patriots 39. Brady needed just four plays to cover 69 yards and throw a 17-yard touchdown pass to Gronkowski. 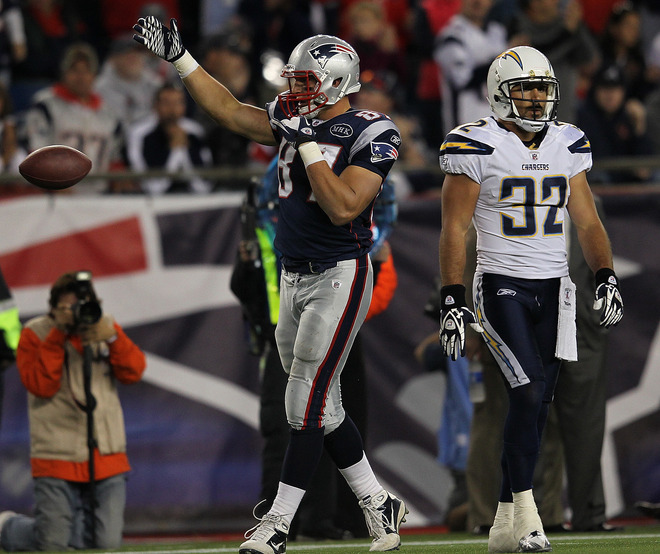 Danny Woodhead ran in for the 2-point conversion and a 28-14 lead. The Chargers came back, scoring just three minutes later on Rivers’ 26-yard pass to Jackson with 5:40 to go. 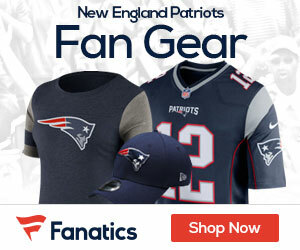 But the Patriots responded with a 16-yard touchdown run by Green-Ellis. In a battle of two teams undefeated, the Pats go to Buffalo next week to play the 2-0 Bills at 1pm.